Project: Wrote artist biographies and copy-edited annual auction catalogues, describing over 200 paintings per catalogue. The Santa Fe Art Auction is the Southwest’s largest auction of classic Western American art. 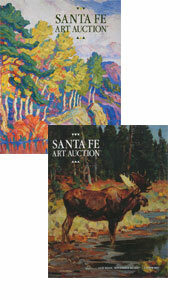 Detail: SANTA FE ART AUCTION CATALOGUE 2006 and 2007. Santa Fe: Gerald Peters Gallery.